A Buckeye Career Center student receives a new form of transportation to get to and from the New Philadelphia campus. Joey Beaver, a junior Welding student, was recently gifted a 26-inch mountain bike, along with a bag of accessories from Next Generation. The organization is made up of United Steelworkers Local 2737 members, which collects, refurbishes, and distributes bicycles to adults and children in need. Officials say BCC nurse Tia McCoury came across an article in a local newspaper about the group and the service they provide. McCoury contacted the group to see if she could obtain a bike for Beaver, who frequently walks, roughly an hour one way. 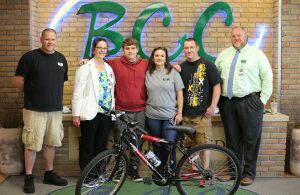 School officials note the group responded, ‘almost immediately’ and presented the bike to Beaver on Tuesday, May 15th at BCC. Steelworkers Union members Dusty Kinsey, Cory Ayers and Lillian Miller attended the presentation.